Few generations of 911 can have been anticipated quite as much as the 991. Yet, at first glance, the new Porsche does not appear dramatically different from its predecessor in the way the 996 was from the 993, and neither is it the urgent and much delayed updating of the previous model that the 964 represented. The 991 is nevertheless a landmark Porsche. Most observers favour the analogy with the 964, which superficially looked very similar to the 3.2, but under the skin harboured much newer technology – the first planks of an updating process not completed for ten years until the 996. The other significance of the latest 911 is that it is the model that will represent the icon on its 50th birthday – an unprecedented anniversary in automotive model history. Although it has been six months since its launch, so understated are the visual changes between the 997 and 991 that a second and longer glance is required to confirm the sighting of the newer model. Porsche’s data sheet reveals that the 991 is 2.2 inches longer than the 997, the front track two inches wider (or more precisely, 46mm on the Carrera and 52mm the S) and the wheelbase is increased by a substantial four inches. It sounds radical, but is far more subtle in the flesh. Even then, it is difficult to take in all the detail, and the 991 really demands a further viewing to begin to form an opinion. The first and unexpected impression, though, is how Porsche has changed the roofline. The 991’s is lower, and the windscreen is more heavily raked, seeming even to shorten the bonnet. It is interesting that the lead stylist for the 991 is Tony Hatter, he of the 993, whose imaginative plans for the roofline of that car were never realised due to lack of budget. How different it all is almost 20 years later. From that roof, the eye is drawn to the 991’s slightly raised rear quarters, a striking new feature which incorporates the slimmer and, to some eyes, more elegant brake and side lights. On the subject of lighting, at the front the new model slightly forsakes the 997’s headlights, which had pleasingly reprised the 993’s, themselves reminiscent of early racing Porsches. The 991’s headlight glass is a more raised oval and wraps itself around the wing. It’s a mild shock, though not as much as the 996’s fried egg look was. Time will tell whether people get used to it or if the 991 Gen2 will feature a redesign, but even from the side the eye picks up the headlamp first, and not the most fundamental change, the 100mm longer wheelbase. So smoothly does this merge with the 20-inch wheels, now standard on the S (19-inch on the Carrera) that you begin to realise that with the new 911, Porsche has a significantly bigger car. Harm Lagaay, the Chief stylist at Weissach from 1989 to 2004 used to say that Porsche was “the recognised master at putting the right amount of surface tension in its design,” and with the new 911, you can see what he means: those sweeping curves have a harmony even a die-hard Porsche traditionalist wouldn’t deny. The overall effect is bigger, but it takes some time to become apparent. Simple details like mounting the side mirrors on the doors rather than the window frame is a pleasing acknowledgement of a traditional Porsche style last seen on the 993, but they now fold in automatically. Porsche’s main objectives with the cabin of the 991 were to enhance quality and equipment, and to improve refinement. The 991’s greater – if deftly disguised – dimensions are reflected in the cabin where the immediate impression is one of airiness, a spaciousness quite unlike previous 911s, which is reflected in the greater shoulder room. Seats have more fore and aft movement, and the rear of the cabin now offers increased luggage/occasional passenger space. The new chassis allows for a deeper boot at the front, too. The 997’s sports seat becomes standard on the 991S, with the previous Sport Plus variety as an option. These seats are firm yet particularly supportive, with the only criticism being that they might be a little tight for those with larger figures. With its base 77mm further forward, the angle of the windscreen is also very different from what the 996/997 driver is used to surveying, and those famous 911 wings are now slightly more visible. The standard steering wheel is flatter and wider, too, making it all the better for appreciating the 991’s electrically assisted steering. The dashboard largely retains the successful 997 layout, the main change being the conversion of the warning light fourth dial to a more useful information screen which replicates the display. Among other information, this includes the sat nav screen (where it is more accessible to the driver), and also the cornering G-force readout delivered by the optional Sport Plus Chrono. The central info screen itself is also usefully bigger on the 991. What is most striking about the new interior is that the long march to improve quality, which began after unprecedented criticism of the 996’s cabin, goes on. There were few complaints about the 997’s insides apart from the tendency of the bolster on the driver’s seat to wear and fray, but with the 991 Porsche has produced a more plush interior with more robust wearing surfaces. Most noticeable is the ‘corporate’ raised centre console housing the gearshift, a development first seen on the Carrera GT and more recently extended to the Cayenne and the Panamera. The handbrake lever has also disappeared, replaced by an electric parking brake. The combination of more space and richer materials has elevated the 911’s cockpit to a distinctly ‘grand touring’ environment rather than that of a mere top flight sports car. The most consistent criticism of life aboard the 997 was the level of tyre roar transmitted to the cabin. This is lowered on the 991 we tried, which had optional 20-inch Carrera Classic rims, and on 19-inch wheels tyre noise is less intrusive still. If there has been any negative reaction at all to the revised interior, it has been of a certain ‘Panamerisation’, which seems to some be taking the 911 ever further from its ethos as a sports car. Porsche would counter that the 911 was always an upmarket car, and the new interior simply reflects the expectations of buyers in this category in 2012. To this, we could add that with three quarters of Porsche production now comprising Cayenne and Panamera, it is no doubt more cost effective to endow the 911 with the same fittings and trim. To understand the real difference between the 991 and the 997, you have to look beneath the sheet metal. The 991 carries over only the 9A1 engine and the PDK transmission from its predecessor, while the rest of the car is all-new. While the PDK remains as on the last 997, the manual gearbox now becomes a seven-speed as standard, giving the economy of a very high top gear with the pleasures of self-shifting. Porsche UK says that sales of PDK to manual were 70:30 for the 997. It won’t hazard an estimate for the 991, but Porsche North America is talking in terms of a 50:50 split. Porsche says that it is possible to get one generation of a model from a given chassis, and at the very most, two. Effectively, the underpinnings of the 997 were those of the 996, a design that managed an impressive thirteen-year lifespan. For comparison, BMW’s forthcoming new MINI will have an entirely new chassis after barely a decade. New in 1997, the structure of the 996 was modified several times. The advent of the 997 meant bigger wheels, which required more space, and the chassis itself has periodically had to be reinforced in places to meet evolving safety norms requiring impact absorption from more angles. The eventual result was a design no longer capable of compromise: Porsche has logically started again, and the result is a longer and wider 911. It is a chassis renovation every bit as thorough as that of the 964, which had to accommodate MacPherson struts at the front, not to mention drive to the front axle and a complete revamp of the passage of air beneath the car to improve stability. In fact, a wider track (in particular) and a longer wheelbase were changes Porsche’s chassis engineers had been calling for some time, but it was not possible to work them into the 997. A longer wheelbase improves stability and the wider track means that a slightly milder anti-roll bar can be employed at the front, thus reducing the tendency to understeer, an inherent 911 trait. As it stands, the revised front and rear running gear combined with the larger dimensions make the 991 a different handling Porsche than the 997, particularly in terms of stability. 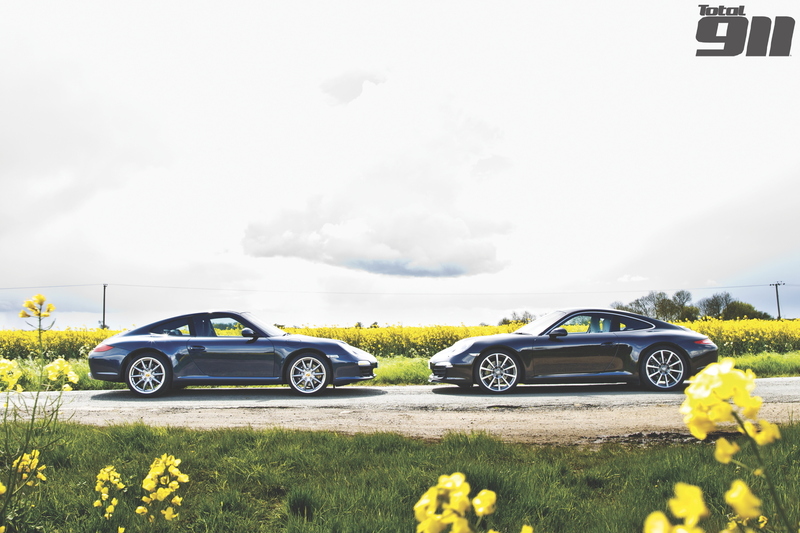 A 911 is an invitation to the keen driver to press on, and the 991 is no exception. While it does feel like a larger car, it loses nothing in terms of the 997’s outstanding cornering agility, and deals with imperfections better, endowing a more refined yet no less rapid ride. Part of the feeling of refinement is contributed by Porsche’s new electro mechanical steering, which filters out much of the vibration and feedback, though keen drivers may find that this first version lacks mechanical interaction. Its accuracy, on the other hand, is faultless. In terms of grip, the 997 already sets the handling benchmark for cars in its class, and its cornering ability is far beyond what can be investigated thoroughly on public roads, so we were fortunate to be able to try both these 911s back-to-back over the famous Hill Route at Millbrook. Here, the new car is nothing short of a revelation. Gone is the 997’s tendency to understeer its way into the bend: the combination of the 991’s longer chassis, which places the engine slightly nearer the centre of the car and wider front track, contributes an altogether sharper turn in and more balanced cornering with a hint of oversteer. It is behaviour that inspires tremendous confidence. Gone is the feeling (on dry surfaces at least) that either end is nearing breakaway, and what seems like ridiculously high cornering speeds can be easily sustained. Thanks to the 991’s greater composure, the driver readily accelerates even earlier from the apex of the bend Porsche has made no claims about the PDK on the newer model, but solicited with our usual enthusiasm, it seemed more responsive than on the 2010 model 997, which shows how Porsche is constantly honing its electronic systems. Porsche brakes represent an industry benchmark. For the new Carrera they are essentially unchanged, carrying over the 997’s 330mm discs and four pot calipers (front), but with enhanced cooling from new ducts. The bite, stability and stamina of 911 brakes have long set the standard, and the 991’s uphold Zuffenhausen’s honour. Porsche’s main objectives with the 911, besides the normal updating, were increases in performance, fuel economy and reduced emissions. This is a squaring of the circle that Porsche has become past master at. Gone are the days when each new generation of 911 was heavier. Weight is the enemy of performance and fuel consumption, and during planning for the 991 an all-aluminium mock-up was built, which turned out to be heavier. Astute use of both aluminium panels (the skin is 45 per cent aluminium) and magnesium has enabled Porsche to reduce the weight of the PDK Carrera from the 1,455kg of the 997 to 1,415kg for the equivalent 991 model, which is quite an achievement given that 58kg of what Porsche calls ‘safety products’ had to be added to the new version. The 9A1 engine from the 997 has been subject to internal changes mostly related to lightening reciprocating parts and drivetrain components and reducing friction losses. The S retains its 3.8-litre capacity, but unusually the base Carrera reverts to a 3.4 version of the Boxster/Cayman S tuned to yield 350bhp, which Porsche says will deliver both better performance and mpg than the preceding 3.6. It’s an impressive claim, but entirely credible when you realise that the electronically variable oil pump introduced in the 997/2 model is now more sensitive to road/engine speed and lateral forces, ramping up oil pressure (which takes energy) only when it identifies the greater stress of track driving or hard cornering. The same philosophy has resulted in the energy saving electric steering. An energy recovery system now operates through the alternator, collecting kinetic energy (without the GT3 Hybrid’s enormous flywheel) from deceleration, which is fed into the battery. Using the same logic, when the accelerator is floored, power to ancillaries is reduced, enhancing acceleration and lessening the overall demand for fuel. A further intelligent saving is the managed cooling system. The 991’s electronic brain confines coolant to the cylinder head, momentarily shutting out the crank case passages, and accelerating the warming up phase when combustion engines are at their most thirsty. In terms of acceleration, only a stopwatch can separate the old and new 911, yet it feels faster, perhaps because it’s lighter and stiffer. Porsche’s figures (listed below) illustrate how the 991 Carrera PDK – which was our test car for this comparison – manages to quietly improve on the attributes of its predecessor in all departments, bar the maximum speed, which stays at 178mph. Power is up by 5bhp, with an additional 3lb ft of torque, and it’s a tenth of a second quicker to 62mph, yet boasts both lower fuel consumption and CO2 emissions. Where the 991 does impress over the old car, though, is with the interior sound level. The newer car, as mentioned earlier, dispenses with much of the 997’s tyre noise. Instead, the (now standard) sport button is linked to an acoustic tuner, which brings the characteristic flat-six exhaust note into the rear of the cabin – a very clever arrangement that is achieved without making the external exhaust note excessively loud. Once again, it is no surprise to find that the new 911 is the better car. The real surprise is how radical some of the changes are and, on the road, how successfully a larger 911 offers the same – if not even more – driver involvement than before. Reworked suspension front and rear and a wider track bring appreciably higher levels of refinement than the 997, but above all, transform traditional 911 handling. Gone is the initial turn in understeer, replaced by an altogether more balanced corner entry and grip. With the 991, Porsche has married the refinement and stability of a GT with the poise and handling of a pedigree sports car – a feat indeed. As regards value for money, the base Carrera 991 is priced at £71,449 in Britain, compared with £67,270 for the final 3.6 997 – about a six per cent increase. For this, you get an entirely re-engineered Porsche with a better quality cabin and higher dynamic capabilities than its predecessor. Yet, that benchmark Porsche quality of ‘feel’ emerges sharpened even with this 991. It’s a tremendous achievement, and the price increase is modest for such a radical upgrade. The combination of performance and economy makes this base 3.4 Carrera the model we would happily opt for. Where the potential buyer may blanch is at the prices on Porsche’s copious list of options, which can add over £20,000 to the invoice. We feel some, notably the Sports steering wheel, are worth having. On the other hand, you may think electronic safeguards like PASM and torque vectoring are essential, but in our experience only a trackday specialist will feel them intervening on the 991. These options do, however, help protect the 911’s resale value at second-hand, as it is always the least equipped cars that suffer the worst depreciation. Finally, we are excited by Porsche’s seemingly bottomless ability to extract yet more power and economy from the flat six, which leads us to think that this famous piece of engineering architecture may now even survive into the next generation of 911. Quite amazing. To read more fantastic, in-depth features looking at all generations of the Porsche 911 – the only Porsche that matters – check out the latest issues of Total 911, available online to order and to download digitally.